I was merely trying my best to differentiate it from Southern style remoulade. This probably explains it better than I could. 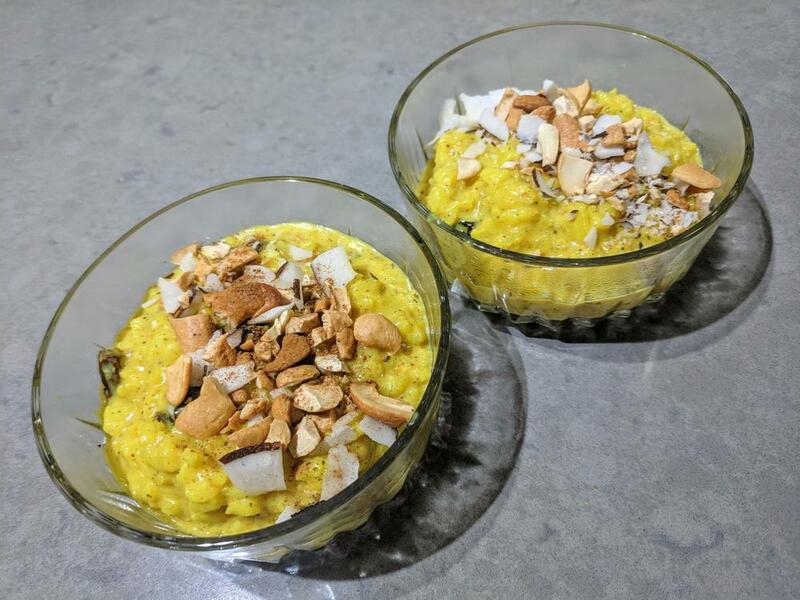 Indian style sweet rice pudding, flavored with coconut milk, cardamom, cinnamon, mace, ginger, turmeric, anise. Plump juicy raisins. Toasted cashew and coconut chips. @shain, do you have a recipe link or text you can share for that pudding? I dearly love Indian style rice pudding, and that looks marvelous. Home fries, scrapple, fresh salsa and scrambled eggs with grated parmesan cheese and diced ramp leaves from the garden. 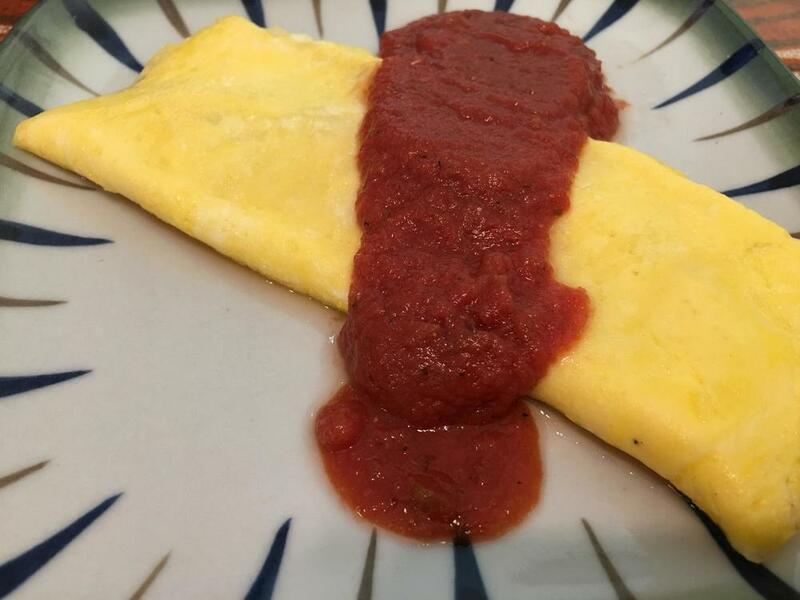 Unphotogenic cheese omelet with salsa. Cook rice and raisins in water until done to your liking, add water as needed, but keep it thick. Add the coconut milk / milk, salt, turmeric and sugar to taste. Cook further or add water to reach desired thickness. Top with toasted cashew or coconut flakes. Eggs scrambled with ham and kale. So jealous about the ramps! They are best suited for higher elevations, so here in CT, I have to let them propagate by not picking the bulbs, just the leaves. I do enjoy them very much!!!! They are a first celebration of spring. 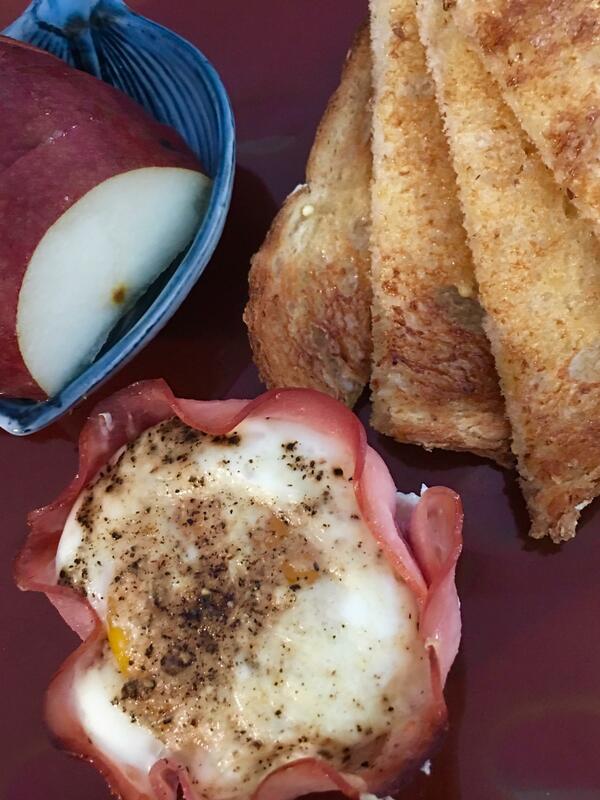 Ham and egg cup sprinkled with grated gruyere and served with toast soldiers and some pear slices. Scrapple with kimchi aioli, fresh picked lettuce, thinly sliced onion and hot house tomato slices on a snowflake roll. - Kaak Purse which is an old typical Levantine sesame type of bread. It is a street treat where the pocket is filled with Zaatar and shaken around before biting into it. It is called Purse Kaak as the handle was large enough for children wrists to carry. - Labneh and Olive oil not in the picture but part of the table. Dessert was typical Aleppian fare with Rose Jam and White Cheese with the Kaak Purse.....we also eat it together with Cucumbers. However the original cheese should have been the Aleppian String Cheese......always a next time. To recap, the Aleppian treat is Rose Jam with flat bread and String Cheese with Cucumbers. I know, I know Jam and cheese and Cucumbers.......but it is divine. Winged a quick stir fry for breakfast this morning. Pork tenderloin thinly sliced and marinated with Shao Hsing, cornstarch, and sesame oil and then cooked in peanut oil. some garlic chili sauce and a little Chinese black pepper sauce. 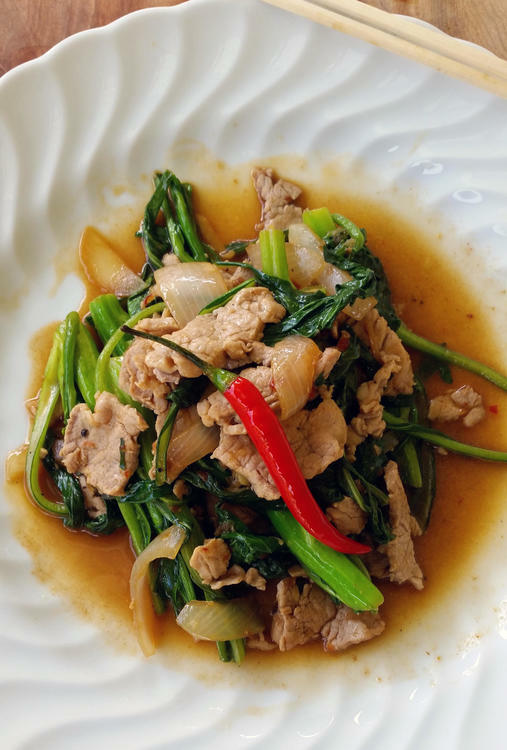 Simmered for a few minutes until the Yu Choy Sum was tender. Didn't bother with rice or noodles. Will definitely make this again soon. 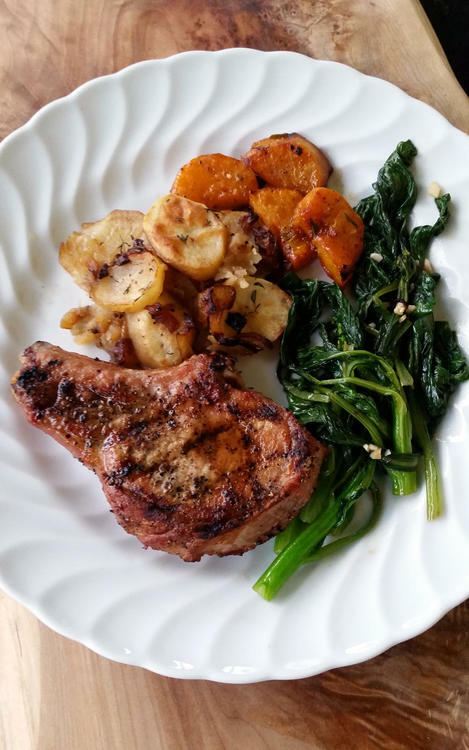 Grilled pork chops with potato gratin made with chicken broth, roasted butternut squash and sauted Yu Chow Sum with garlic. Made this this morning. I used chopped dates, as I don't care for raisins. It's wonderful! I would have NEVER thought of putting turmeric in rice pudding, but it adds a marvelous note to it. This will be breakfast for a few days! Ramp and blue cheese omelet, scrapple, an English muffin and fresh salsa. I'm so happy to know that you enjoyed it. I've learnt to appreciate turmeric in sweets after sampling a drink of turmeric milk and honey a while ago. It works very well. half a BLT and 1/4 of a cappacola and provolone grinder. Scrapple and sliced leftover brussel sprouts, that I colored up in the same pan, an English muffin with ramp compound butter and fresh salsa. I happen to like both the price and flavor of Walmart imitation V-8. Meatball sandwich on homemade baguette. 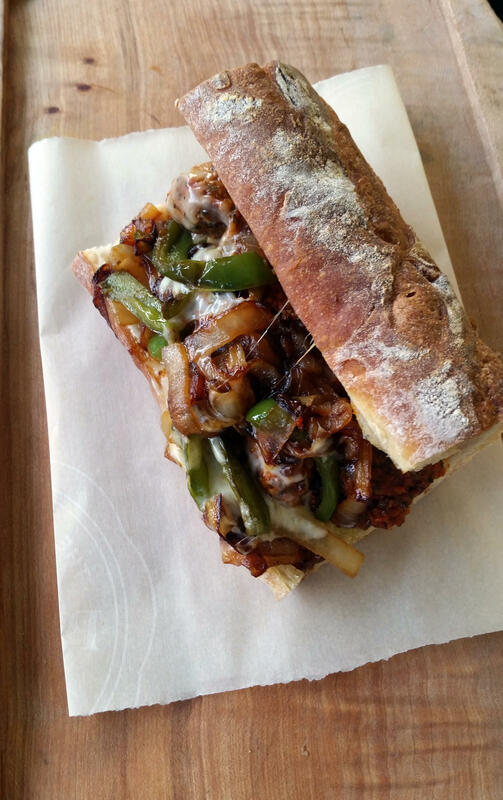 Fried onions and green peppers and mozzarella cheese. Baguette was warmed up in the steam oven, filled and put back into the steam oven for two minutes to melt the cheese. I worked yesterday so I made dinner for Moe's breakfast and I took the same for lunch. 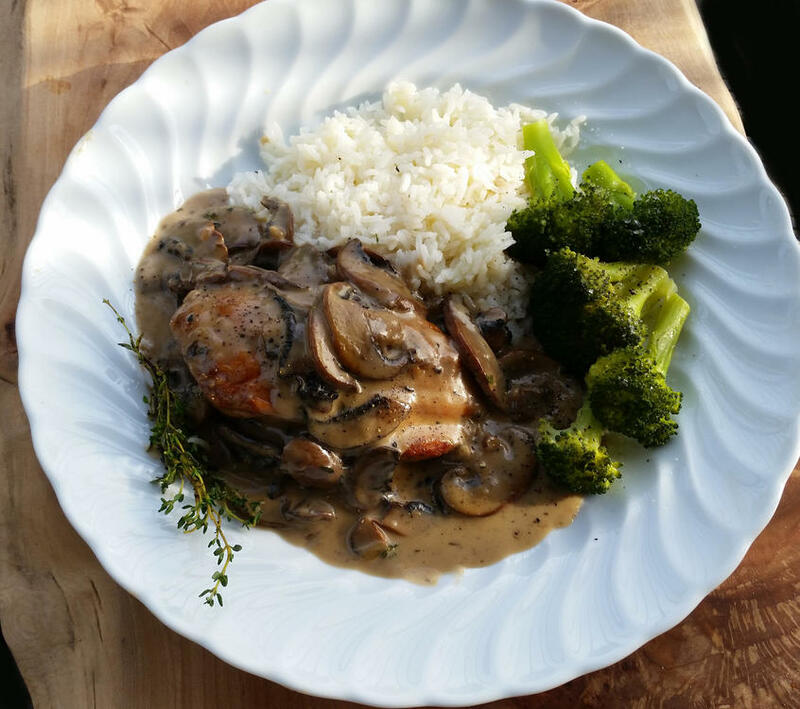 Pan fried chicken breast, in a mushroom sauce. 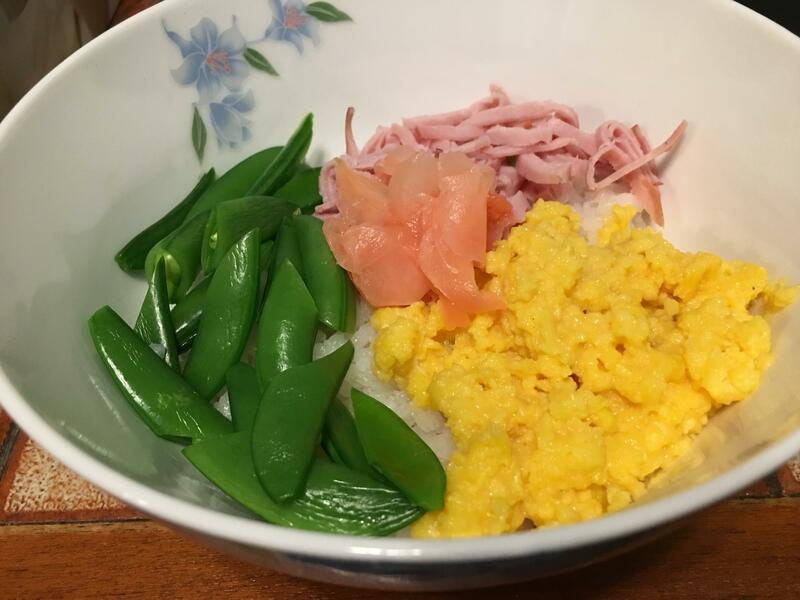 Untraditional and inauthentic three colour rice bowl. Japanese rice, blanched sugar snaps, scrambled eggs, slivered ham and pickled ginger. English muffin with ramp compound butter, panko fried zucchini, scrapple and fresh salsa. 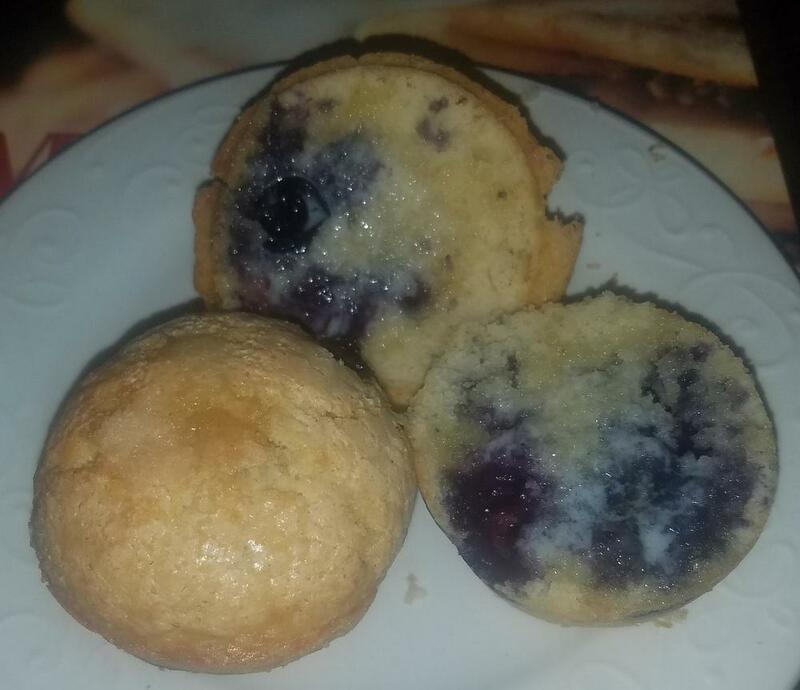 I'll take half an english muffin please. But where is your Kentucky Derby glass???? ?